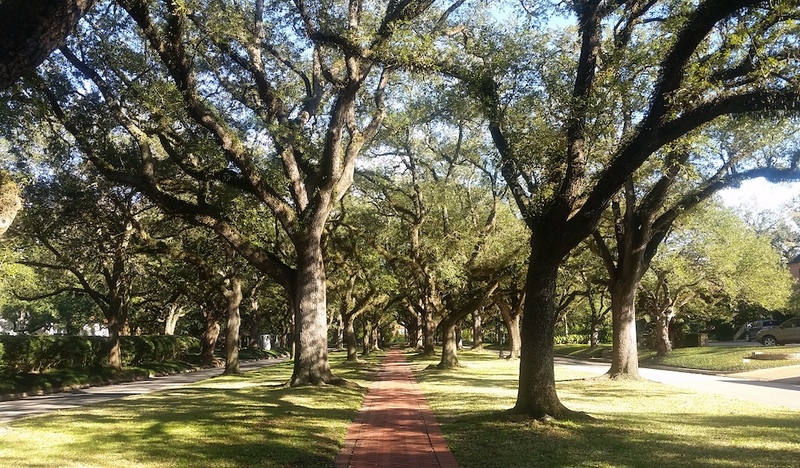 Grab your camera and snag a photo beneath the lovely live oaks on the brick esplanades of the Broadacres Historic District. Located within the Boulevard Oaks community just north of Bissonnet Street and south of Highway 59 in the Museum District, Broadacres has become known for its lush tree canopies, historic home preservation, wide streets with medians, and, because of the serene landscape, photoshoots. Comprised of only 26 large lots on either side of North Boulevard and South Boulevard between Mandell Street and Graustark Street, the quaint neighborhood’s brick medians have played host to countless photo shoots from visitors trying to snap the perfect photo for wedding engagements, birthdays, graduations, quinceañeras and more. Developed by prominent Houston attorney and banker James A. Baker, Sr. and his son, attorney James A. Baker, Jr., in the early ’20s, the high-end subdivision was listed in the National Register of Historic Places in 1980 and contains the work of three of the most prominent Houston architects of the period: William Ward Watkin, Birdsall P. Briscoe, and John Staub. Recently, area residents posted signage declaring that the esplanades were the neighborhood’s private property and no longer available for photo shoots. However, the City of Houston has since confirmed that the iconic brick backdrop is free and open to the public for photoshoots. However, visitors are encouraged to respect neighbors and their private property. Whether you’re stopping by for an impromptu photo snap or a staged photo shoot, the city only asks that the sidewalks remain unobstructed by equipment and clear for public use at all times. Location: 1300 N Blvd, Houston, TX 77006 (approximately); the Broadacres Historic District is comprised of 26 large lots on either side of North Boulevard and South Boulevard between Mandell Street and Graustark Street, just north of Bissonnet Street.